Barb and Pat Nevins of Homewood are looking forward to a fun day on Sunday, Oct. 2, when they join the volunteer ranks at the Cancer Support Center’s Walk of Hope. 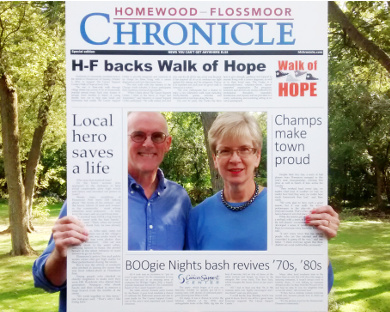 The 2016 Walk of Hope kicks off at Irwin Park, 18120 Highland Ave. in Homewood, at 10:30 a.m.
After two years of reporting on the community, the Homewood-Flossmoor Chronicle is becoming an active participant in local events. On Sept. 10, the paper will sponsor Flossmoor Fest and also a new golf-and-craft-beer event, Fore and Pour, hosted by the Homewood-Flossmoor Park District. Dorothy Johnson will share her indomitable spirit with an estimated 1,000 fellow walkers on Sunday for the Cancer Support Center’s 21st annual Walk of Hope. On Sunday, Oct. 4, the annual Cancer Support Center Walk of Hope is expected to bring 1,000 participants into Homewood for the 21st annual fundraiser. The goal is to raise $115,000.